Kurilovich was looking for a PhD position in Europe when ARCNL started hiring in 2014. Again, he stepped into a brand-new research institute. 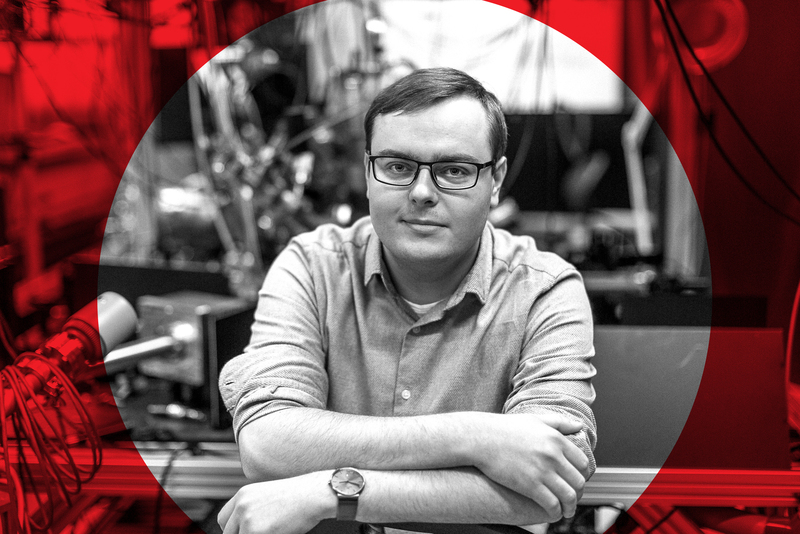 He was one of the first PhD students to start at the Amsterdam-based institute that is a public-private partnership of NWO, the two local universities and semiconductor equipment manufacturer ASML. The main reason to found this new research institute was the need for fundamental research for tomorrow’s nanolithography. During the four years of Kurilovich’s PhD project in the EUV Plasma Processes group led by professors Ubachs, Hoekstra, and Dr. Versolato, ARCNL grew into an institute with nearly ninety people working in research and support. Its ten research groups focus on the physics and chemistry involved in key nanolithography technologies. ARCNL just moved to a state-of-the-art new building with a lab floor that is mechanically separated from the rest of the building to accommodate their delicate experiments. Research at ARCNL is inspired by the Dutch nanolithography industry, which applies EUV light in its machines for producing the next generation chips for computers, smartphones and many other small but powerful electronic devices. With its very short wavelength, EUV light can print extremely small patterns. One of the challenges lies in producing this EUV light, because conventional light sources and lasers are unavailing. Kurilovich spent the first part of his PhD period building the experimental set-up that is now used by two large groups at ARCNL. It creates a sequence of very small tin droplets and uses laser pulses to make these droplets hot enough to become a plasma emitting a flash of EUV light. This happens in two stages. A first laser pulse hits the droplet, causing it to accelerate and deform. After that a second, far more powerful laser pulse ensures the knock-out: the deformed droplet changes into an EUV-emitting plasma. The set-up can accommodate many different techniques to investigate exactly what happens at a fundamental level. Kurilovich’s own experimental work concentrated on investigating how the first laser pulse accelerates and deforms the tin droplet upon impact. This shaping of a tin droplet is necessary for efficient generation of the desired EUV light when it is hit by the next laser pulse and turned into plasma. Kurilovich investigated the acceleration and deformation of tin droplets by various types of laser pulses. 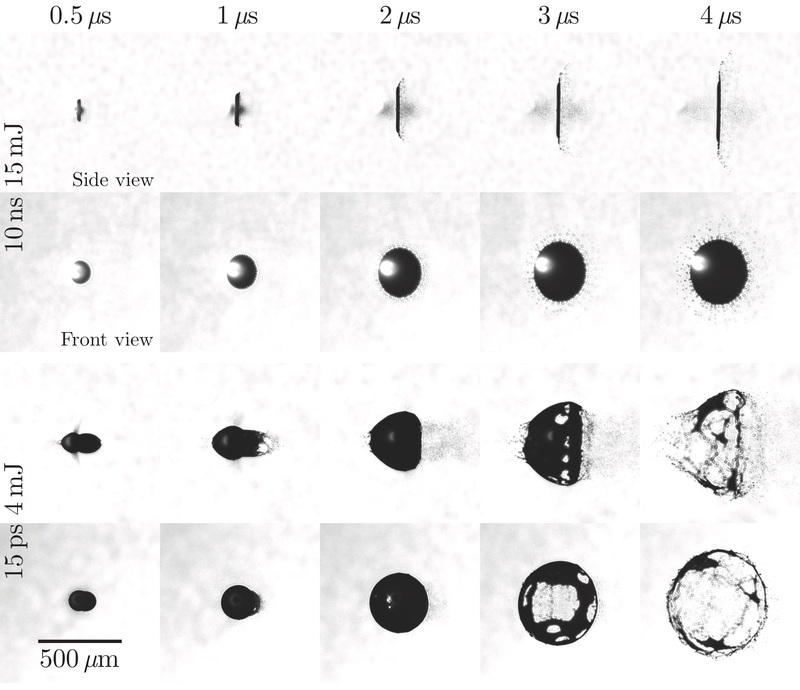 A 10 nanosecond laser pulse causes the tin droplets to reshape into a disk (upper panel), whereas a much faster, 15 picosecond laser pulse induces a cavitation bubble inside the droplet and causes its rapid fragmentation (lower panel).